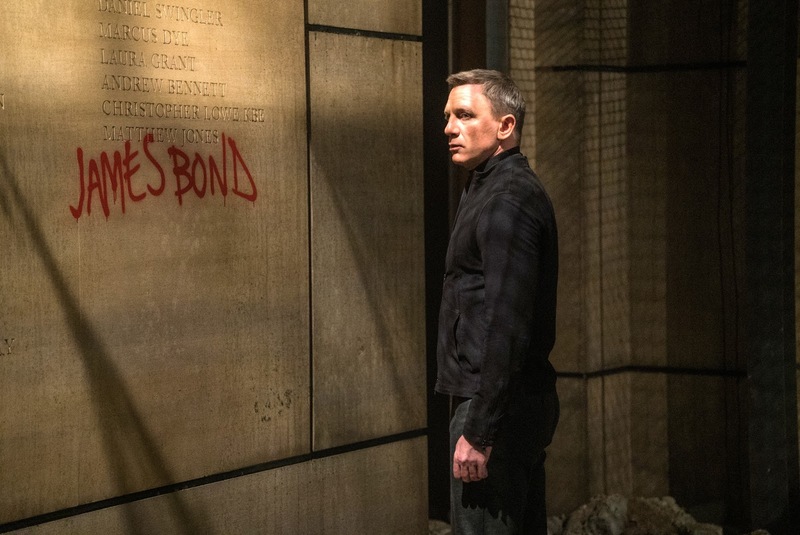 Bond films are always measured by different criteria than other films, as the proliferation of lists that accompany any of its releases attest. What are the best Bond women, villains, theme songs, cars, henchmen, etc.? In almost every one of these cases, save for the sequence described above, Spectre is found wanting. 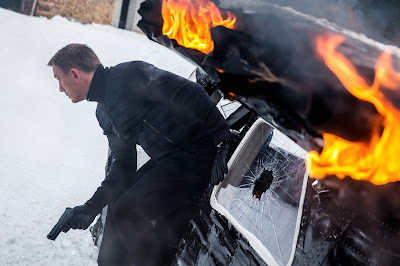 Craig continues to be the best personification of 007 since Sean Connery made it his role more than 50 years ago. Both the franchise and the actor benefited from embarking on a journey in a direction where the cinematic Bond had never gone before, inward and backwards to his origin. Beginning with Casino Royale, the three previous Craig films showed us how an unseasoned, reckless British agent slowly became the cool-tempered, lethal double-0 operative we remembered from the Connery days. Each of Craig's films added more pieces to the puzzle, revealing the source of his misogynistic distrust of women, introducing the supporting cast of Moneypenny, M, and Q that would become so significant to Bond. And each inspired its directors to elevate the filmmaking from the merely perfunctory to the occasionally sublime. 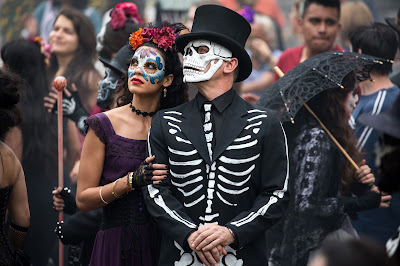 Now Spectre reintroduces the villainous organization that due to decades-long real-life legal wrangling has been largely absent from the Bond films since Connery's last film in 1971 (!). Led by the soft-spoken Franz Oberhauser (Christoph Waltz), S.P.E.C.T.R.E. 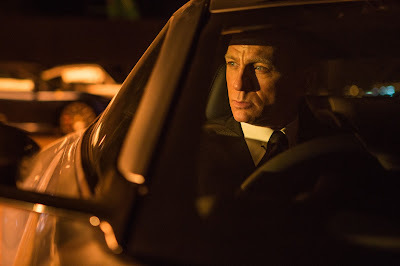 is soon revealed as the all-encompassing conspiracy behind all of 007's woes in the past three films, sponsoring every villain from Le Chiffre (Mads Mikkelsen) to Silva (Javier Bardem), killing everyone from Bond's first love Vesper (Eva Green) to the first, maternal M (Judi Dench, who makes a pivotal cameo in this one). 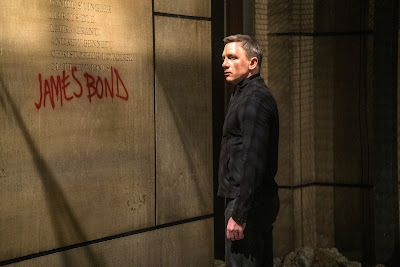 Oberhauser is known to Bond, a ghost from his long buried past whose cause for a vendetta against 007 and the world order he represents seems ridiculous when Spectre deems it necessary to blatantly spell out the subtextual resentment between the two rivals. This in, of all things, a scene where the villain monologues while the hero is hooked up to some torture contraption not unlike the ones seen in Goldfinger or Austin Powers for instance. As for the rest of Spectre's elements? Sam Smith's title song is one of the dreariest in 007 history. The female characters, Moneypenny (Naomie Harris), Lucia (Monica Belluci) and Madeleine (Léa Seydoux) are all afterthoughts, and that is saying something for a Bond film. Given a little more to work with are Ralph Fiennes as the M who was almost Bond and Ben Whishaw who is quirky with a capital Q as MI6's best quartermaster and gets to do some life-threatening espionage fieldwork. Former WWE champ Dave Bautista makes a strong impression as Mr. Hinx, a S.P.E.C.T.R.E. operative who relentlessly pursues Bond until their chase finally culminates in a train-car brawl inspired by the central setpiece of my favorite Bond film, From Russia with Love. Less impressive, and indicative of how out of step and dated the entire franchise seems when it's trying so hard to be topical, is Andrew Scott as Max Denbigh, a British functionary who wants to mothball the double-0 program in favor of drones and electronic surveillance, a plot point that hasn't seemed fresh since Enemy of the State covered much the same ground back in 1998. It's no wonder then that Craig has seemed positively vitriolic in Spectre's promotional rounds when asked whether he is up for another one of these movies. After all of this time spent revitalizing the character and giving him an inner life absent from everything except Ian Fleming's source novels, all the pieces have finally fallen into place and it's... meet the new Bond, same as the old Bond. I wrote on SPECTRE today too and was similarly disappointed. Which is a shame as I really loved CASINO ROYALE. Will be interested in what sort of roles Craig dives into in the future.